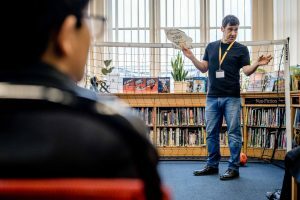 We were delighted to welcome Tom Palmer to help us celebrate World Book Day. In assembly he talked about the importance of reading, and how discovering new books inspires ideas for his stories. 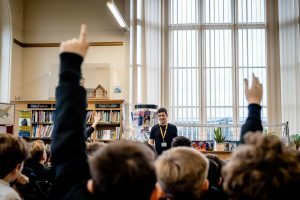 After an hou r with all the junior school boys, Tom came to the library where all year 7 boys were looking forward to meeting a real live author. He told them how important magazines and newspapers had been when he was a reluctant reader as a teenager. He loved reading match reports, which then inspired him to try books. He was 21 before he did A-Levels, then became a mature student at Reading University. He finds celebrity magazines essential when he is researching the background to his stories, as they shed light on footballers’ lifestyles. He also does research by travelling to the countries where his books are set, and by reading biographies. It took Tom twenty years to be published, as he had his first story accepted when he was 40. He sent Foul Play to many different publishers, but was told that a mixture of football and crime would not sell. He writes on a laptop, then sends his work to his publishers for editing and typesetting. Book covers are not selected by the author. His latest book, D-Day Dog, out in May, originated in the true story of German Shepherd dogs being parachuted into Europe, to sniff out soldiers who were hiding, and to detect mines. They were trained to detect the differences in smell of the uniforms of American, German and British soldiers. He is working on another Second World War book about German children who were rescued from a concentration camp and sent to Windermere. 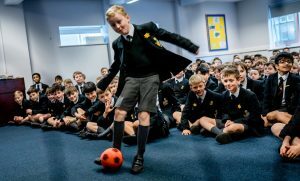 Tom enthralled the year 7s with an exciting book and magazine quiz, ending in a penalty shootout won by Adam Blagbrough, who received a trophy. Mrs Lewis, Miss Darkes-Sutcliffe and Mrs Rea performed well in goal, but won’t be taking up the many offers from the Premier League. Tom had lunch in the library with a group of keen creative writers from the sixth form. 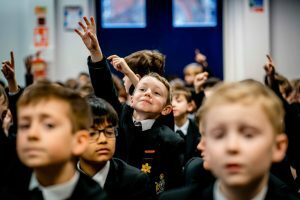 They discussed many literary and sporting topics, such as the poetry of Tony Harrison, football fiction, creative inspiration, and the boys’ own work. Tom also told them about the practicalities of getting an agent and a publisher. 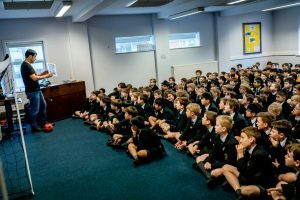 Talented boys from years 7 to 10 were invited to a creative writing workshop in the afternoon. The theme, animals i n war, inspired some excellent ideas. The groups set their ideas in the Vietnam War, where dogs were used as lookouts, the English Civil War, using King Charles spaniels as metaphors for the character of the King, cats bringing food to a besieged town, and dogs being trained to work with the military police. The Year 10 group set their story in an African war. Tom was very impressed by the standard of the writing, and told the boys to turn their good ideas into stories. We would like to thank Tom for a day which inspired many readers and writers, and we look forward to reading his new book after Easter!